shuffleboard, basketball and an outdoor shower. fireplace and floor to ceiling windows. with large showers. The bunk room has queen over queen bunkbeds. The bathroom includes a large shower. separate icemaker, microwave and a 3rd dishwasher! Outside: Gas Grill, Parking for 3 cars, Basketball, Shuffleboard, Deck, Dock, 2 concrete patios, screened porch, Outdoor seating, Just finished huge patio with built in firepit! Boat Rental available for experienced boaters only. Inquire about 22 ft Hurricane Fundeck with tubes skis and vests. Fire pit on new patio near dock. Hurricane Fundeck 22ft available for experienced boaters only. Inquire about cost. Maximum 10 guests in home. No smoking and no pets; security deposit will not be refunded if these rules are broken. We loved this house. The Hostess was amazing as well. The pictures do not do it justice. There is nothing I would change about the layout or amenities and I am a picky guy. Another wonderful Clemson weekend for 4 East Coast couples. We travel quite a distance and really appreciate the Draddy house accommodations. 'Home away from home' comfort! While most of our children have graduated (and off the payroll) we continue the weekend football tradition. Lynn is wonderful to work with. Thank you!!! 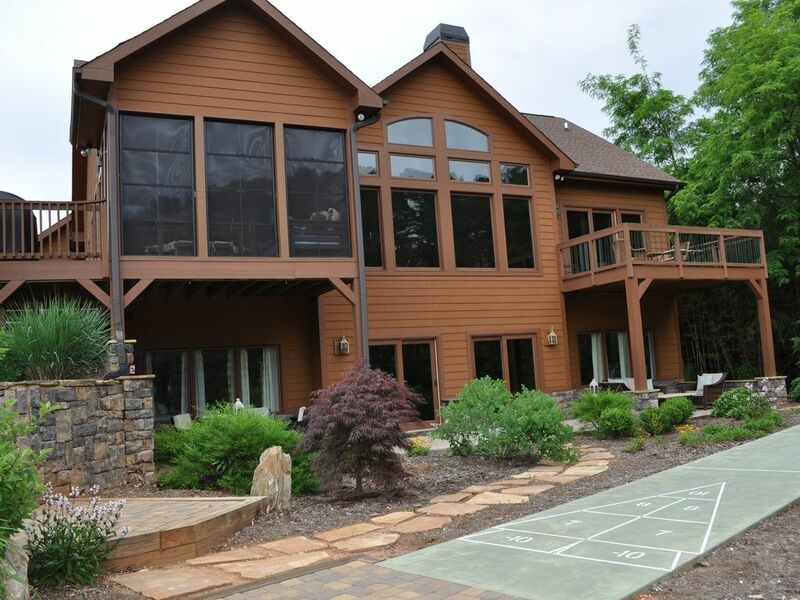 Perfect lakefront stay just minutes from Clemson! We loved our stay at the lake house! It is spacious, beautifully appointed, and so comfortable. It was perfect for our group of 7 to enjoy the lake and also have great access to Clemson for football! Thanks for the great stay. Owner is very responsive to inquiries. Had a few minor glitches that could have been worse, but due to owner's availability every issue had a positive outcome. This is a large home designed for a large group of friends or family. Price point is not for the faint of heart for a week on the lake, especially if being leased by an individual, but a few couples sharing the cost makes this a fantastic getaway! Lynn’s home is done to perfection, from the decor inside to the beautiful landscaping of the property. Every detail thought of and extremely well laid out for a large group....right down to the two dishwashers in the kitchen! This house was made for entertaining. The private cove location on the lake was perfect for swimming kids as we didn’t have to worry about passing boats, but could still enjoy beautiful views of the lake from the dock. We were within minutes from anything you could want in Seneca and an easy 15 minute drive to play The Walker Golf Course in Clemson. A lot of great memories were made here and we can’t wait to come back! Thanks again Lynn! We really enjoyed your beautiful home and everything it offered. So close to Clemson and the lake is awesome. Would recommend to anyone.